Khaya klainei Pierre ex Pellegr. ; Khaya caudata Stapf ex Hutch. & Dalz. The tree reaches a height of more than 50 m. The bole is usually straight, clear and cylindrical to 30 m in length, buttressed. The trunk diameter attains 100 to 150 cm. From Sierra Leone and Liberia to Gabon. It is distributed through coastal West Africa. 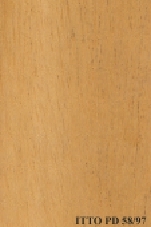 The sapwood is creamy white to yellowish white, it has a thickness of 5 cm. The heartwood is pink to light red brown, it is clearly demarcated. The silver figure is fine. The grain is slightly but systematically interlocked. The wood is reported to be frequently medium textured. 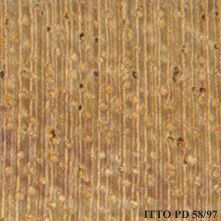 The wood surface is described as low in luster.